I really don't enjoy eating meat, I mean, I love bacon fat and I love eggs (more so the yolks), but when it comes to meat...I really just dislike eating meat, any meat and not only that but I get a massive stomach ache (like doubled over cramping) when I eat meat. It's been three weeks and I still can't eat meat, I'm eating more fruits, nuts, veggies and oils then anything. I ate meat a couple days ago and spent the entire next day near lethargic and my stomach cramping for hours. It was awful. What should I do? Should I just cut out meat? Find other sources for protein? It really seems like dairy (which we cut out anyway) and meat are the root source of my stomach problems. yes on the liverwurst! i craved that as a vegetarian too. and i also have problems digesting meat so will take your herbs advice. Well I see you have moved on with another question. So I will end my responses. Fish, crustaceans, mollusks. 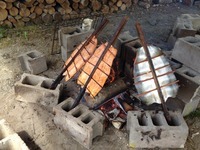 How about smoked salmon and eggs, or a hangtown fry of oysters and eggs? Oops, I just read your comment that you don't do well with fish and had only been a vegetarian for a short time. Hopefully the enzymes will help and maybe you could do a food allergy test as well. Do you like fish? Maybe you could start with that. @ST, I am the same way with shrimp on a empty stomach. I hope not. lol Now that I have insurance, I could most likely go and get that checked. And waywardsister, I don't do well with seafood, I have always gotten a queasy, nauseous feeling after eating seafood, including fish. I can't even smell things like shrimp or lobster, because it makes my stomach turn (much like the smell of melted cheese makes my stomach turn). I'm going to look into Enzymes anyway, it seems like it will help with the process in general, but I'm just worried. I was a all in vegetarian for about 2 weeks, then I started having random (and terrifying) chest pains, so I started looking into a different diet and found this one. So, I wasn't vegetarian for a distinctly long time. And, to be honest, I've always had troubles with meat, even when I was a kid, I hated eating meat as a kid and would tend to just eat the veggies and whatever starch was on the plate instead of the actual meat. I just have never liked them, I try to eat meat at least once a week and try to incorporate eggs into meals (mostly stirred into something). Seconding this - the first time I ate meat after being veg, I projectile vomited. Enzymes help with the transition, bc you're likely not really producing any (since you haven't needed them in awhile). How do you do with seafood? Look at the Now Food Digestive Enzymes (or something like that). If you were a vegetarian for a significant amount of time, your body could have "forgotten" how to digest meat and you need to slowly retrain it. The protocol is a bit tricky, but I'm pretty sure Robb Wolf has it explained on his website somewhere. Sometimes you push through things and sometimes you must listen to your bodily needs, and they may change over time. If you have always had a problem with meat and was only a vegetarian for a couple of weeks, it seems to me you need to listen to what your body is telling you. There is no gospel that says your diet must be meat-centric. You may in fact have an allergy to meat (very rare) or something in the meat or whathaveyou but in the meantime I see no sense in trying to force it down. It may also be as simple as adding ox bile to regimen. If you were my client I would run a battery of tests to try and get to the heart of the matter. What would I do? Eat bacon fat and eggs for starters. That is what you like so go for it. Then there are bone/meat broths giving you many of the goodies of meat without the problems you are experiencing. I don't know how you do with dairy fat (ghee/butter) but you might consider that. Then there is the whole world of coconut(fat) and its use with tubers of all sorts. And maybe raw meat is okay for you. I for one can eat raw oysters (which I love) but am allergic to cooked oysters. Many ways to skin this cat. No need to force meat if your body can't tolerate it but you do need to experiment until you find what works for you. Also, you don't mention the "macronutrient" breakdown of your diet. I would be curious what it is. I hear you on this one. I was a vegetarian for over 10 years before switching to a Paleo diet. Enzymes are key as everyone has mentioned. They REALLY help. I started with fish at first. I would have a small serving of fish with veggies for lunch and dinner, and then as my body became acclimated to this, I added a serving of meat each day. Now I eat more meat than fish but still try to incorporate fish regularly. Good luck! If you experience this transition similar to the way I did, you will adjust. It's a process! GAPS Diet might be helpful for your problems. Also fish is less hard on digestion than meats,so maybe start off with fish and see how that goes? Well, I can only speak about my own experience about this, but starting certain meats was easier for me because I craved them. I had cravings for bacon and liverwurst, and used to eat the chicken parts when I got a whole chicken for my family (I'd ususally eat the parts the cat wouldn't touch instead of throwing them away.) Every once in awhile, I craved a burger, and wouldn't feel too well afterwards. Starting in with shrimp and fish cooked with vegetables was easier. Meat and carbs just doesn't work for me. I still have to keep the carbs way down or I don't feel right. I also don't feel right eating just plain meat. I have to have my leafy greens or herbs. Meat cooked with greens is a favorite, and my stomach always feels better when I combine the two. maybe you have a protein allergy or intolerance?